Check out our HNS film review for Eddie the Eagle. Eddie the Eagle is inspired by the true story of Michael “Eddie” Edwards (Taron Egerton) and his childhood dream to represent Great Britain in ski jumping during the 1988 Calgary Winter Olympics. Edwards is not particularly athletic but he is determined to compete in the Olympics despite everyone including his parents and British Olympics officials telling him it is impossible. 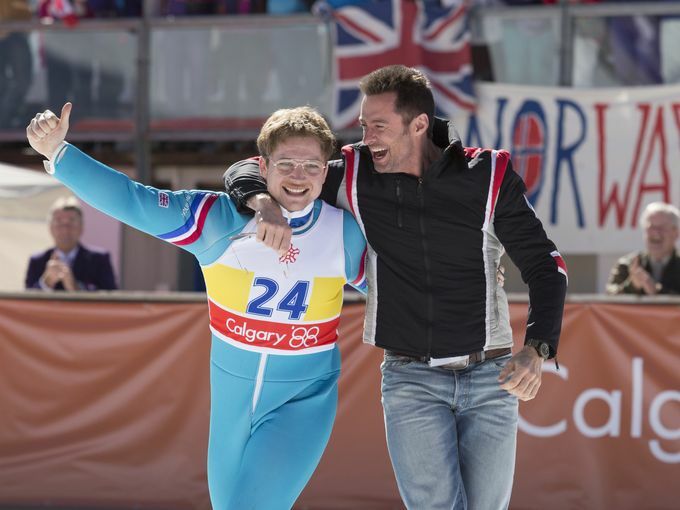 Eventually Eddie meets Bronson Peary (Hugh Jackman) a former American Olympic ski jumping champion who reluctantly agrees to help him train. Perhaps one of the most unforgettable scenes is Peary teaching Eddie how to properly take off and land by pretending he is making love to Bo Derek…I’m certain I will never watch Olympic ski jumping again without thinking about it. The scenes of Eddie training in Germany are both amazing and scary since he had no prior experience in ski jumping but it shows his courage and determination. Egerton plays Eddie as eccentric and a bit quirky which helps make it believable this young man would be so willing to risk his life to achieve his dream. ‘Eddie the Eagle’ reminds us to never give up on our dreams and to realize winning doesn’t always mean we have to finish in first place. This film opens February 26 and will certainly be one of the feel good movies of 2016. Edwards became known as ‘Eddie the Eagle’ after he successful landed a jump in competition. He was so overjoyed he began flapping his arms pretending to fly around and shouting out to the spectators who loved his exuberance. Rupert Grint, Ron Weasley in Harry Potter, was considered for the role of Eddie.